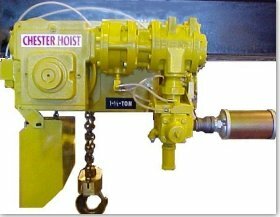 The Coffing Model TMM-140-A Air Manipulator is lightweight, easy to use, and is the ideal workstation hoist. The unit weighs less than 20 pounds and operates at 100% duty cycle. Take advantage of improved performance features including pendant control adjustment and new auto-stop valve.Rated Capacity 300 Lbs. Smooth Operator Efficient rotary vane motor provides high uniform torque for quick response, and smooth, quiet operation. 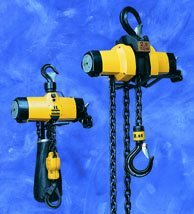 Handle-mounted pendant control can be adjusted for right or left-handed operation. Sure-grip handle provides easy one-handed use. Precise and infinite speed control for accurate load spotting. 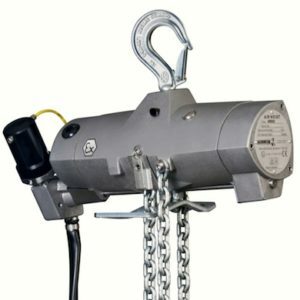 Prevents lowering the unit past the maximum reach; wire rope will not reverse-wind in the hoist. Swivel top and bottom hooks with latches standard, for portability and quick installation. Self-winding lifting cable stores conveniently inside unit.